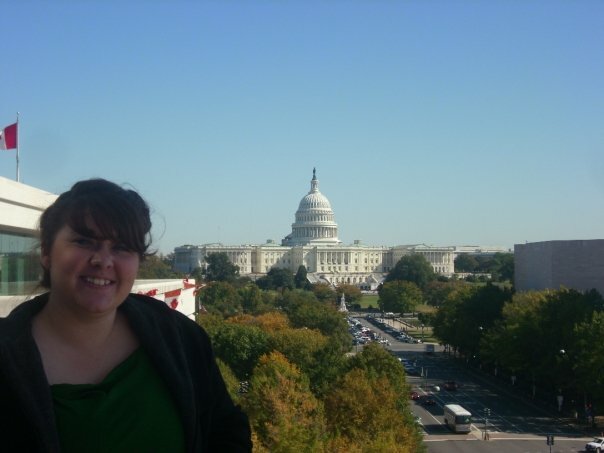 This is me last fall on the viewing deck at the Newseum. I really, really need to pack. In four days I’ll be leaving for my my next adventure — spending three months in Washington D.C. I will be joining five other undergraduates for an internship with the Scripps Howard Foundation Wire. I’m kind of in denial right now about this entire thing. It doens’t feel like I’m about to leave home for three months to go to a city where I don’t know anyone so I can play reporter for a little while. Ha, when I say it that way, its kind of intimidating. (‘ve never been one to get exhilerated by making friends out of strangers. I’m sort of the wallflower type. But when I remember that I get to live a dream for a few months, all my concerns vanish. Yes, I’m going to miss my family and friends back home. But this is just another adventure of a lifetime! Like the Gypsy Trip, I’ll be blogging throughout my internship. My posts should be more like twice a week instead of daily, though. My plans are to post one blog about the work side of my internship and another just about different sights and activities in the city. I’m compiling a DC Bucket List and I’m planning to cross everything off between Sept. 13 and Dec. 17! If there’s anything you know of in DC that I should see, post it in the comments or send me an e-mail at stone.cassie@gmail.com.